During World War II, the home front offered unprecedented levels of moral, financial, and labor support for the war effort. This was no accident. 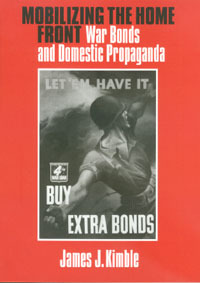 Through the U.S. Treasury Department's war bond drives, Franklin D. Roosevelt's administration strategically cultivated national morale by creating the largest single domestic propaganda campaign known to that time. Donald Duck and Bugs Bunny joined Judy Garland, Dorothy Lamour, and Lana Turner to urge Americans to buy war bonds, helping to create a virtual army of home front soldiers. Dr. Seuss drew cartoons, Irving Berlin wrote songs, and Norman Rockwell designed posters to help raise over $185 billion for the struggle, most of it coming from average citizens who well remembered the poverty of the Depression. In Mobilizing the Home Front, James J. Kimble marshals archival documents, public appeals, and a wealth of internal memoranda, reports, and surveys to offer a new understanding of the government's eight war bond drives and the psyche of the nation at war. With roots in propaganda studies, military history, rhetorical criticism, and peace studies, this book adds new dimensions to our understanding of the waging of war by the "Greatest Generation." JAMES J. KIMBLE, an assistant professor of communication at Seton Hall University, received his Ph.D. from the University of Maryland. He is also a Distinguished Honor Graduate of the U.S. Army Chaplain Center and School.